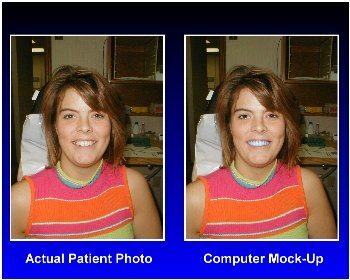 Computer imaging can be used to show you what cosmetic dentistry could do for your smile. Many cosmetic dentists provide this as a complimentary service for all patients who desire it. The office will take a simple digital photograph of your face. 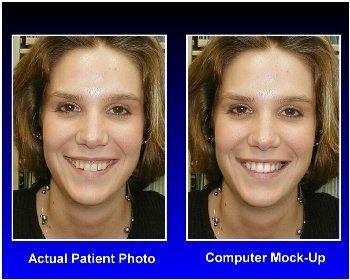 They download this into the computer, and then use a cosmetic dentistry computer imaging program to place the smile design of your choice with your face. Then they print out a copy of this photograph for you. Why not try this for your smile? It’s fun, educational, and there is no fee. With cosmetic dentistry, you can have the smile you want. Using a combination of bleaching, bonding, porcelain veneers, and rapid minor orthodontic tooth movement, your teeth can be re-shaped and re-colored with a great deal of artistic latitude. 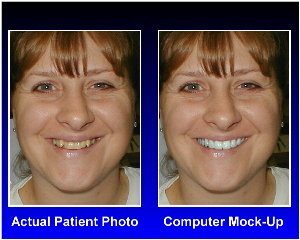 Click here to view before-and-after photographs of porcelain veneer cases treated by MyNewSmile referral network dentists. Click here to view another page of porcelain veneer pictures. What should be done for small teeth?